Looking for hotels near George V Metro Station? This hotel is located in central Paris, just 656 feet from the Champs Elysées. It offers a fitness room and rooms with marble bathrooms and cable TVs. Superb customer service from everyone we encountered everytime! 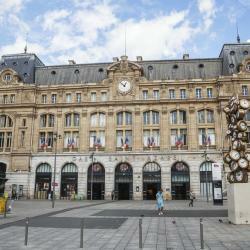 Hotels with great access to George V Metro Station! In the 8th district of Paris, just a 5-minute walk from the Avenue Champs-Elysées, Hôtel Le Marianne has an honesty bar and fitness center. The Arc de Triomphe is just over half a mile away. The staff at this hotel are amazing and the location is perfect. Francois 1er is located on a residential street 656 feet from the Champs Elysées and 1804 feet from the Arc de Triomphe. The hotel's cocktail bar features a winter garden. Very nice and clean room and bathroom, very good location.